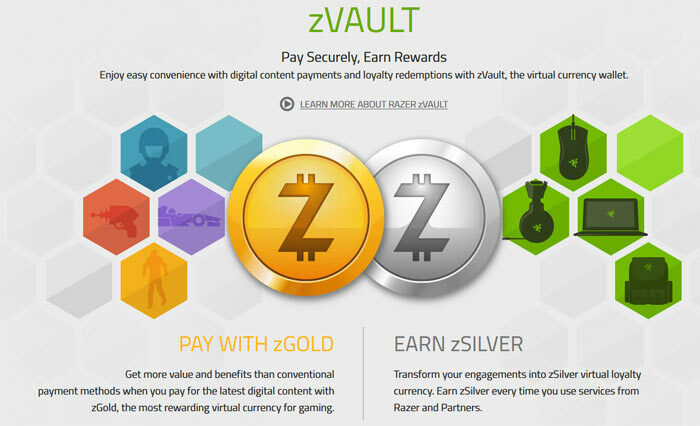 Razer is attempting to create "a complete gamer economy," via its zVault ecosystem. The firm's zVault is a secure digital wallet for gamers with zGold and zSilver virtual currencies for payments and rewards. Razer says that users will pay securely for digital items using zGold (100 zGold = US$1) while zSilver is earned from purchases made using zGold, and through Razer software use, such as Razer Cortex and Arena. Speaking about the new digital wallet and virtual currency Min-Liang Tan, CEO and co-founder of Razer, said "This is much more than a club or credit card perks program or micro-transaction solution. Our ultimate vision is a complete gamer economy expanding from the zVault ecosystem. It's social, interactive and truly useful, opening the doors to a safer way of doing business and an expansive rewards market for our fans." 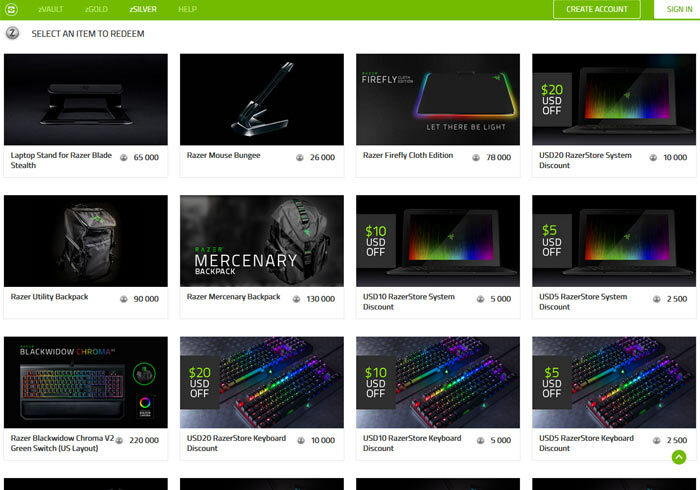 Razer's press release mentions a plethora of store and game development partners ready or preparing ways to accept zGold payments, however the most interesting part of the virtual currency launch might be the zSilver you can 'earn' and spend on Razer hardware. Play games via Razer Cortex for 245 days to earn an RGB mechanical gaming keyboard. 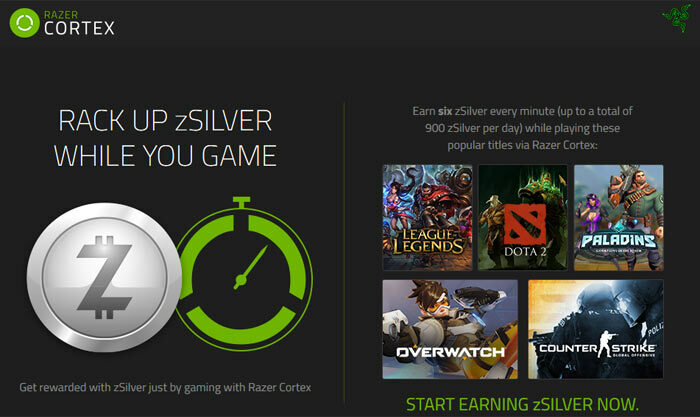 The Razer Cortex software allows you to launch PC games and earn zSilver as you play. The gaming optimisation and launching app allows gamers to earn 6 zSilver per minute - up to a maximum of 900 zSilver per day. At launch time, popular titles such as Overwatch, CS:GO, League of Legends, DOTA2, and Paladins let you earn zSilver via Razer Cortex. Thus in five and a half days Razer Cortex users can earn enough zSilver to get a US$10 Razer web store discount to spend as they wish. At the other extreme of the currently available offers, after 245 days of earning 900 zSilver from simply playing games you would be able to get the Razer Blackwidow Chroma V2 Green Switch gaming keyboard with just your earned zSilver virtual currency. To celebrate the official launch of zVault, Razer is offering various benefits to Razer ID users for a limited time. Initially you can grab a starter gift pack of 2,000 zSilver, up to 30 per cent additional bonus zGold from wallet top-ups, more ways to earn zSilver and reap discount offers, plus bonus in-game items for selected purchases using zGold. The gaming optimisation and launching app allows gamers to earn 6 zSilver per minute - up to a maximum of 900 zSilver per day. Until the 7th of April, when it'll be 3 zSilver per minute. Mind you, never one to shy away from freebies, I'm sure I'll eventually earn enough to get a free keyboard in 2-3 years of playing Overwatch….